Don't you love buttercream frosting on your cakes? Chocolate and cream cheese frostings have always been my favorites, but this time of year a fruit flavored frosting is delicious. Here's how you can make a delicious buttercream frosting with natural fruit flavors. The secret is to use jam in the frosting. This frosting is perfect any time of year but is especially fabulous for birthdays, baby showers and bridal showers. Yummy and pretty! 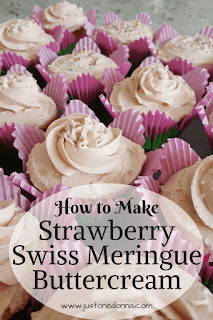 This is a recipe for Swiss Meringue Buttercream, flavored with strawberry jam. The key to a fresh fruit flavor in your frosting is to choose a really good quality jam. 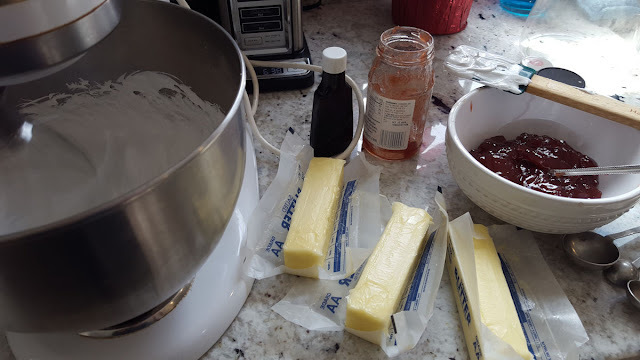 I used strawberry jam, but you can use any flavor of jam that will enhance the cake you have made. Be sure to choose a seedless jam to ensure a smooth frosting that can easily be spread. I made these cupcakes and a "smash cake" for my grandsweetie's first birthday. A smash cake is a new-to-me concept, but I guess all the "cool" one-year-olds are doing it these days. Here's a picture of the smash cake. This post contains affiliate links for your convenience. I may receive a small payment, at no cost to you, if you make a purchase through a link. The smash cash is a six-inch, white cake. 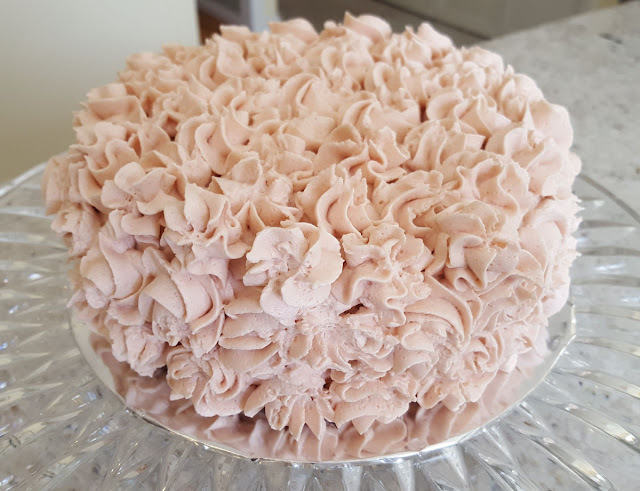 I crumb-coated it first with the strawberry Swiss meringue buttercream frosting and then piped flowers all over using an M1 decorating tip with a cake decorating bag . The cake has lots of yummy frosting that is sure to delight my sweet little one year old! You don't have to be a one-year-old to love this frosting. Its hint of strawberry flavor will delight everyone. Place the heat-safe bowl of your electric mixer over a pot of simmering water on your stove. 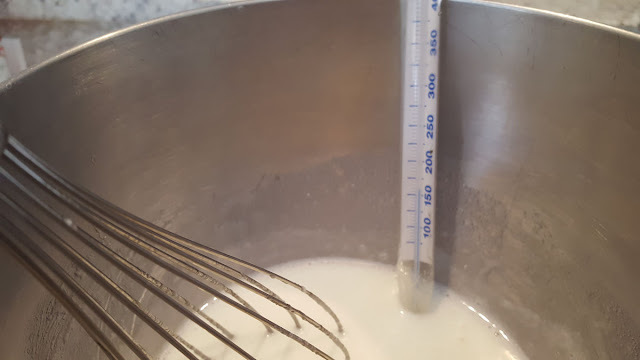 Attach a thermometer to the side of the bowl. Add the eggs whites and sugar to the bowl. Using a whisk, stir the mixture continuously until it reaches 160 degrees F.
Return the bowl to your mixer. 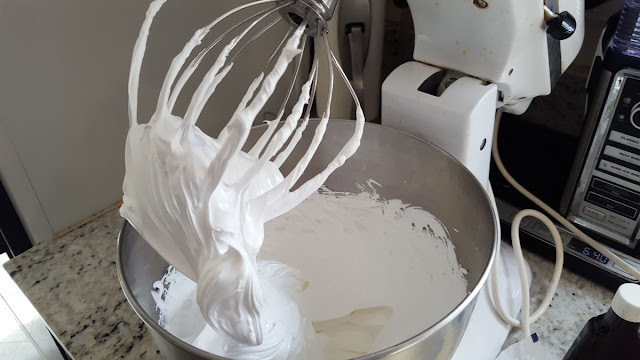 Using the whisk attachment, beat the egg mixture until it is fluffy and smooth, about six minutes. Add the butter, in chunks, beating well after each addition. After all the butter has been incorporated, add the vanilla. Put the jam into a small bowl to check for smoothness. You don't want any chunks of fruit. If necessary, puree the jam in your food processor. 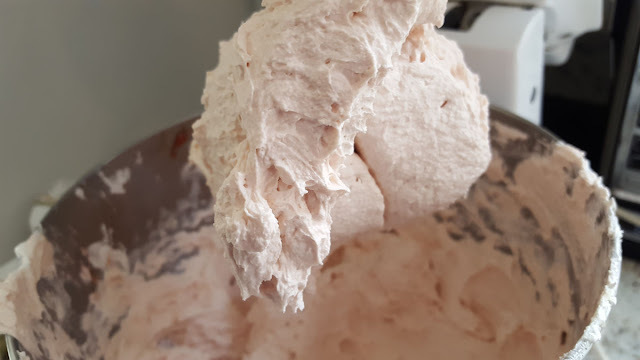 Stir the jam into the frosting until it is completely blended with the frosting. 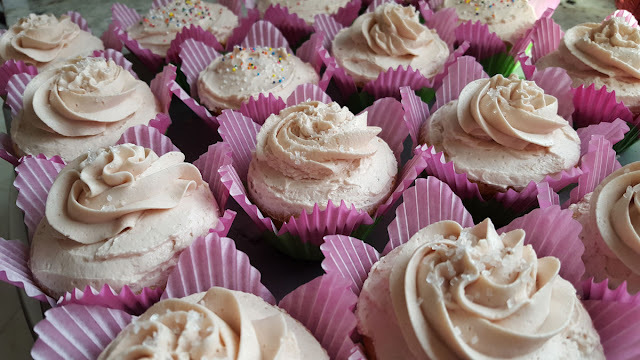 The strawberry jam will give your frosting a light pink color. Now you are ready to frost your cake or cupcakes. Thank you for sharing this post on Facebook, Twitter, Pinterest, and Yummly!